The challenges and opportunities of undertaking an effective modern law reform reference common to smaller jurisdictions such as South Australia and Tasmania was the theme of a recent productive visit to the University of Tasmania and the Tasmanian Law Reform Institute by Professor John Williams and Dr David Plater, the Director and Deputy Director of the South Australian Law Reform Institute (SALRI). Lucy Line, SALRI researcher, joined part of this visit. There are close links between SALRI and the Tasmanian Law Reform Institute. Both are similar independent law reform bodies with strong output in research and law reform. SALRI is based at the Adelaide University Law and was established in December 2010 by an agreement between the Attorney-General of South Australia, the University of Adelaide and the South Australian Law Society. The Tasmanian Law Reform Institute is based at the University of Tasmania Law School and was established in 2001 by agreement between the Tasmanian State Government, the University of Tasmania and the Tasmanian Law Society. Professor Williams, Dr Plater and Ms Line discussed some of the challenges and opportunities for modern and effective law reform and consultation common to smaller jurisdictions such as Tasmania and South Australia during their visit with a focus on suggestions for joint research and law reform collaboration and potential closer co-operation on projects of common interest. 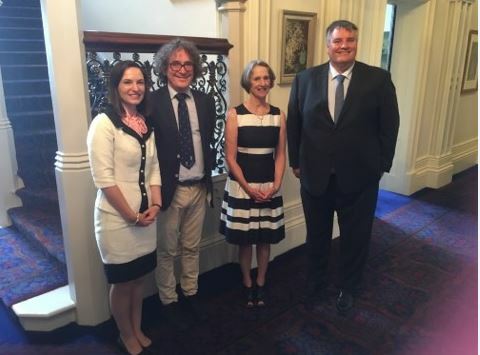 During the SALRI visit, Her Excellency Professor the Honourable Kate Warner AC, Governor of Tasmania, kindly hosted lunch at Government House on 19 January 2018 for SALRI and the Tasmanian Law Reform Institute. Professor Warner is a former Director of the Tasmanian Law Reform Institute. For more information on SALRI and its work, please look at https://law.adelaide.edu.au/research/law-reform-institute/. This entry was posted in Research, Society & Ethics and tagged adelaide law school, law reform, professor john williams, research, salri, South Australian Law Reform Institute (SALRI). Bookmark the permalink.